One of my favorite pieces of the ds106 fleet of awesome is The Daily Create – something we built together last year to provide a platform for regular creative challenges. While we use it within the ds106 courses taught at UMW, it is a low overhead way for people to participate in our (non-bovine) online community/course. which as Giulia Forsythe noted was pretty much what we have built. This led to a stream of tweets of enthusiasm, and I was even starting to say we could build a clone site pretty easy. In fact, part of me is interested in seeing if we can make the site into a WordPress theme/plugin package, which is certainly doable but will require some making some hard coded bits generalizable and configurable. And while my memory cells were fuzzy at the time, Dr Garcia was right that she had suggested this early, with an idea perhaps of overlaying a way of tagging the challenges to maybe organize them into groups for different age students. @techsavvyed @cogdog @gcouros @giuliaforsythe @twoodwar I mentioned this idea awhile back. I think all you need is an annotation to search. Yet, on reflecting and getting input form others, I fall back a bit to wondering what is it about the current site that prevents it being used by any level? Yes, there are some assignments (telling a story about car keys) that would cause challenges. There are alos likely other issus on schools where using services like flickr, youtube are blocked. But we do not have a massive amount of activity; we get more responses when we do a photo Daily Create, like 12-50, but when we do video or audio, we generally see a handful of responses- what is the value of splitting this even more? I see the main value in seeing more interpretations of the assignments, not splintering them into say, Middle School Daily Create and Slovenian Lawyer Daily Create sites. So my question is, would some of those who expressed interest in this perhaps want to help us review the upcoming challenges and see what it would take to modify them as to not make them impossible for younger students to do? And really, when I think about it, this is the framing teachers always do for their students- they could easily recast the challenges in a more age appropriate way. Or by adding new ones to the mix . I am not dismissing the idea, but because it is going to take some development time for which I may not have nor are getting paid to do, I have to ask why not find a way for one site to work for more people rather than creating copy sites that are relatively similar? Also, I have to say, the one kind of challenge I would like to add but has baffled me is something that is written. There is no way for our site to easily aggregate stuff written at remote web sites, and I cannot think of something that is like a YouTube or flickr of Written Things. About the best might be something that is submitted via a form to the Daily Create site. It has to be something we can have a widget or gadget to easily display, like the ones we use fot the services currently supported (and if there is a viable alternative for soundcloud that provides an embedded player based on tags, I am keen to know). I am wide open to ideas here, and am not trying to clutch on to the Daily Create, but I might need to hear a stronger case as to why a separate site is needed. I’d leave it as one site. If someone wants/needs a splinter cell they can always FeedWordPress it. I’m more and more in favor of breaking down the walls between ages/grades and school/real world interactions when it can be done in spaces like this. Make a photo that represents the passage of time. Represent the passage of time. would open up more choice without compromising the concept of the site. I’m actually against opening more choice. The very purpose of TDC is to push people to try a media they would not normally choose to do (left to their own, most people will not do video or audio). Plus it would make it way more messy to aggregate to one page. If someone wants more choice, then that could be the way they frame a TDC within their own class or space. I love the idea of multiple media responses. I suppose that this could be done at a local site without changes to the ds106 site. The responses just wouldn’t be aggregated. Slightly disappointed that the most crucial aspect of ds106 and Daily Create didn’t come up in the post. It’s all about community. The biggest roadblock I see in creating one gigantic coordinated, collaborative community. The idea of pushing people to try more media is the driving force of the Daily Create, but is that necessarily what George or any other K-12 educator is looking for with their community? Further more, do the communities out there in K-12 land necessarily fit with the current community that exists in both the ds106 and Daily Create community? Do we try to force both communities together, and “make them work”, thus pigeon-holing segments of the community into certain areas, or do we encourage interested parties to stay and play for a while, get a sense of how the system works, then help them start up their own community? To use an analogy from my book-selling days that I’m sure everyone will jump all over me on, we don’t steer elementary or middle school age students toward the New York Times adult best seller lists when we want to get them interested in reading, and likewise, we don’t point adults towards the “tween” section if they’re trying to get back into reading. Certainly when it comes to creation, especially with digital media, we can have common areas where we co-mingle (the public library or book store), but there are distinct spaces that we go to for our respective communities (children’s libraries, kids book stores, etc.). These are sometimes physically set apart from the more “adult” spaces, and there’s value in that. Not just from the standpoint of age-appropriateness, but from creating spaces where critical peer-learning can happen. Kindergartners can do great 4 icon assignments, and create videos, but I certainly wouldn’t have them submit their work alongside the type of student pieces found in the Adobe Youth Voices or ds106 communities as the topics being wrestled with in those communities wouldn’t be appropriate for Kindergarten. 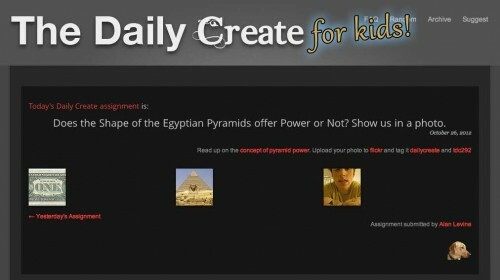 I am extremely excited to do a Daily Create for K-12, and several of my blog posts and experiences sharing student examples of ds106 assignments prove that students can handle this, but the challenge is where and how do we create that space for them online? I’m more than willing to take on that challenge, and please don’t discount my thoughts as being too “protectionist” or discordant. I understand what you are saying, but perhaps there is an assumption on what it means to have the works of different groups in the TDC mix. Would it change how you do this if the work kids did appeared along side those of college students, grandmothers from spain, etc? I am not even sure what the Daily Create “community” is- frankly it is rather small. On days when it is an audio video, it consists of Norm and maybe 3 other people, and on photo days, there are maybe 10-40 max who do it. I frankly would like to see a bigger pool, and having kids in there would make it more interesting. I do not think the analogy of the New York Times reading versus kids learning to read firs, the spread in what we are talking about is not that wide. But I did not see anything discordant or protective- I am waiting to hear more about how a KIds Daily Create would be drastically different. I am not opposed to the idea, and just spoke up because what George was proposing is what is already built for the TDC. Like I said, I am wanting to see if the site can be replicated. But some one/group is going to have to champion and be the community leader for making sure there are enough assignments in there, and managing the site, its more than I can take on now. Sure I know lots of people would like to see it, but I want to know who really is going to step up and take the ownership of it. PS- You know I love you, right? Like I said, I knew the analogy wouldn’t hold up well, and the idea we’re getting it is much more complex than that of a passive medium (i.e. reading) and it more active and critical (creation, sharing, etc.). I would love to see a bigger pool as well, and granted the community that I see partake in the Daily Create (take this with a grain of salt as I haven’t participated recently) could be defined as well-practiced learning practioners. Regardless of where they are on the digital media competency spectrum, it seems that people who participate are for the most part comfortable with the practice of creating, sharing, commenting, and more importantly, be reflective, in a digital space. That is extremely significant to me when I compare that community (as small as it might be) to the much different community in my district. Again, this isn’t to nay-say anything, just an observation. Even many of our high schoolers have not been subject to this type of coordinated learning community participation outside of their own personal social networks. I’m not so sure it’s that a Kid’s Daily Create would be different so much different than the small community participating in the Daily Create on a regular basis. There’s just something inside of me (perhaps the former elementary educator I used to be) that’s focusing on how the community interacts. Regardless, you bring up a great point. Someone has to “coach”, facilitate, mentor, etc. any large new group, the same way new sections of ds106 are brought into the fold. For all of our pontificating in K-12, there is still a lot of resistance for many of us to just “jump in” to a community that might be alien to us, without at least someone who is already a part of our own face-to-face or personal learning community that’s willing to guide us on the journey. This reminds me of stack overflow. They originally let anyone (who paid) create a stack site for their communities. Most failed and never took off. Now they run new stack sites through a beta process and only the ones that have sufficient activity get out of beta and are hosted for free. My point is that it’s probably not the technology, but leadership and community that are required to make daily create clones successful.